Generally, when I post I try to be positive. There’s enough good places and good beer and too little time to talk about bad experiences that there’s not much that I bag out. If that was the case, and this blog had been around a few years ago, a place that would have gotten a serve would have been the downstairs Hunter Street. This was one of those horrible underground bars that Sydney still has a few of. Descend some stairs into a pokie filled, dimly lit, macro-lager lair where the staff would barely have a pulse except on the rare occasions that they had to pay a jackpot. 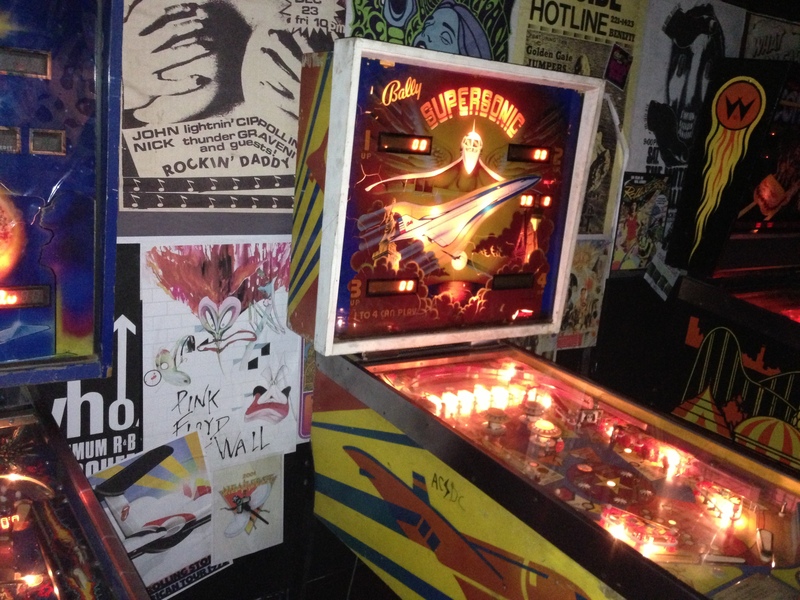 Not there’s necessarily anything wrong with sub-terranean bars – West Wynyard’s proven that. I’d been tipped that that had all changed and that the blokes behind Baxter’s Inn have launched a new venue in the Hunter Street site. 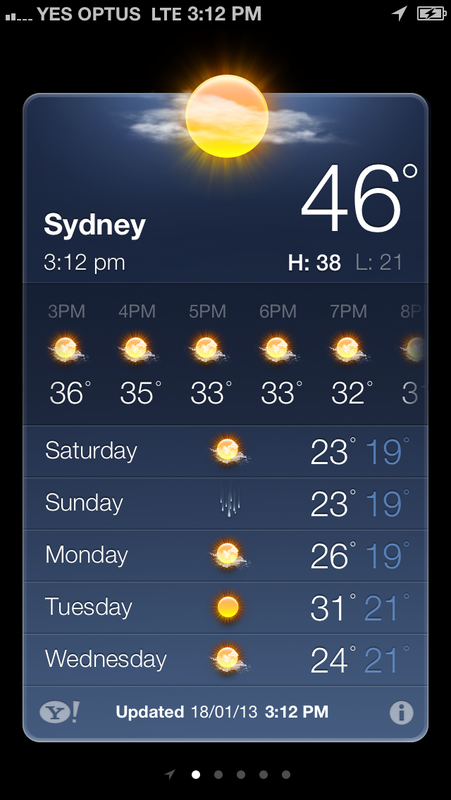 And given Sydney was experiencing its hottest ever day, an underground was probably the place to be. 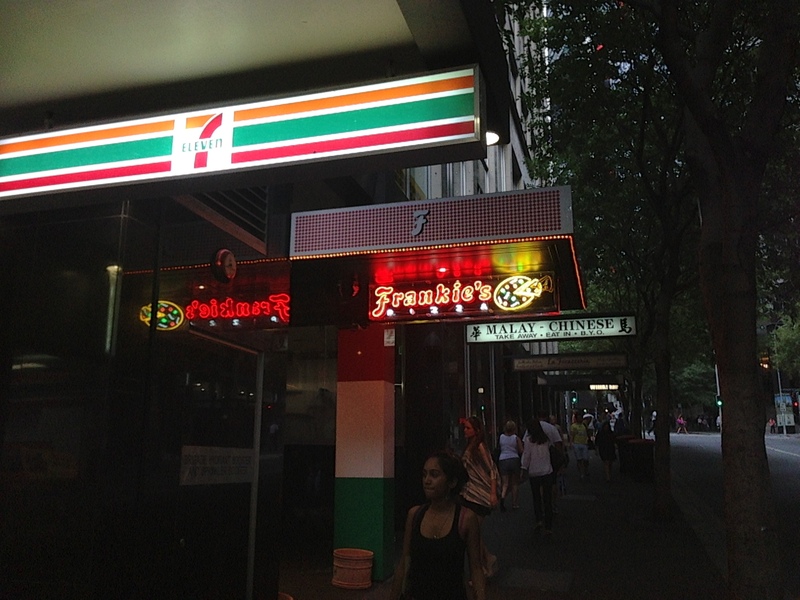 Frank’s Pizza is located next to and under one of Sydney’s finest Laksa joints and takes pride in an unassuming entrance. 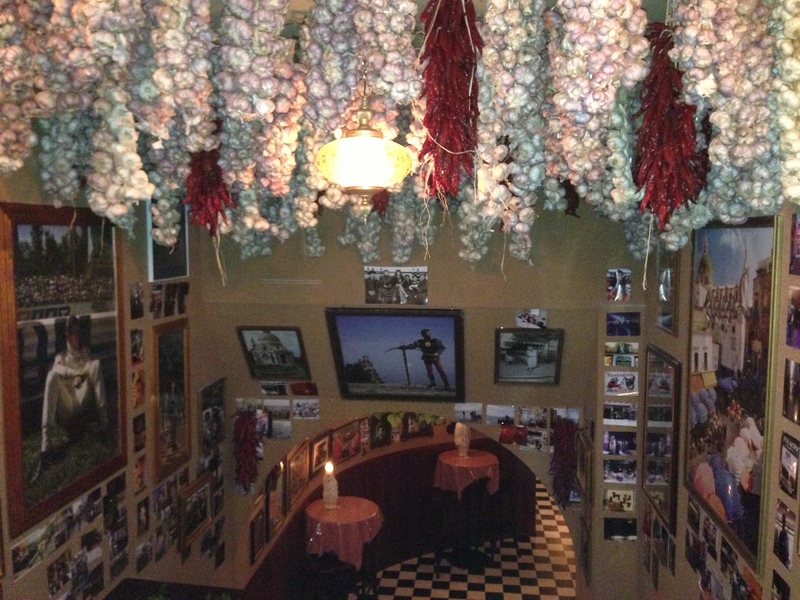 You are confronted by a stairway with enough garlic bulbs hanging from the ceiling to kill Dracula and all his descendants. The style is Italian family restaurant gone mad. That’s all a little misleading, because you walk through another doorway and the real action occurs. A long bar dominates the right-hand wall with a vast collection of spirits against the wall. Around all the other walls is a fantastic collection of vintage band and concert posters. Great care has been taken to select all sorts of cool kitsch. Two faux crystal Pabst wall lights are just fantastic. 3 or 4 vintage pinnies are close to the door. There’s a combination of tables, chairs, bar-stools and plenty of chairs at the bar. Also, any bar that plays “Last Great American Whale” by Lou Reed on its playlist is an absolute winner for me. Seemed that I wasn’t the only one – the place was packed. Even if you weren’t trying to escape the heat by going underground, this place would do well. Many of Sydney’s small bars place a greater emphasis on their spirits and cocktails. Frank’s Pizza has a bet both ways. There’s frozen Margaritas and other cocktails – but they also have done a fantastic job with their beer range. There’s 9 tap beers – one macro and 8 craft beers. I love the handwritten daily list. The selection is eclectic with beers from the US, UK, North Parramatta (Riverside Brewing Company), Melbourne and Nowra (HopDog) amongst other places. I’m not a fan of the plastic handles that they serve the beer in, however. I am a fan of their beer list. 70 beers ranging from lagers, ales and dark lists. They’ve really picked out some weird and wonderfuls. Temple Sour for example. Other brands included Evil Twin, Rogue, Brooklyn, Beer Here, Birra del Borgo, Mikkeller and 8 Wired. Something I’ve not seen before is the $160 3 litre Duvel bottle. The beer I bought off the list was the Moylander Double IPA, by Moylans. 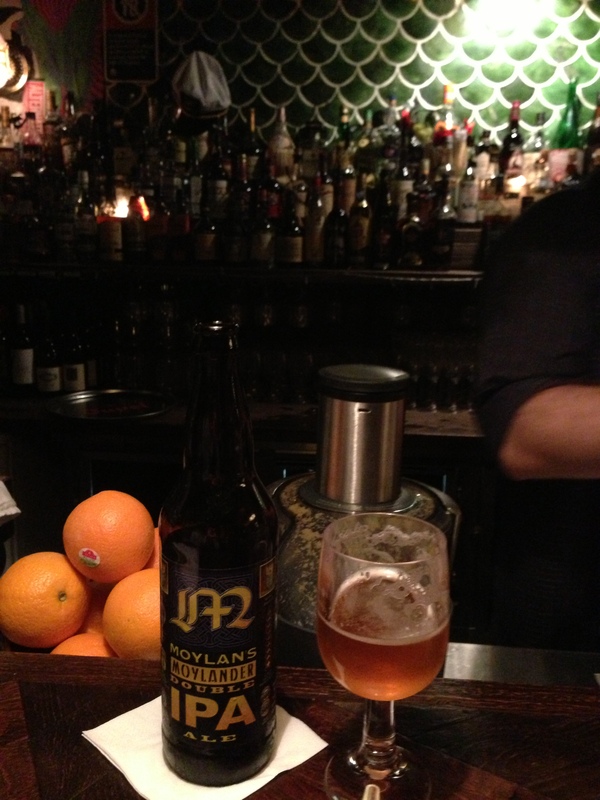 Moylan’s is a brewery and bar located in between San Francisco and Sonoma. For a what looks like a local brewery, they’ve done a pretty good job to penetrate the Australian market. Frank’s Pizza isn’t the first place I’ve seen Moylan’s on the East Coast. 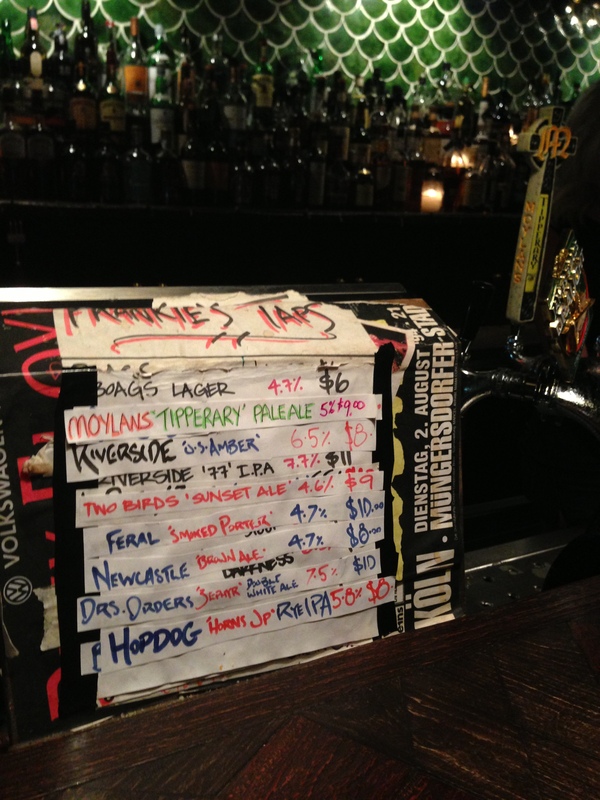 Tipperary Pale Ale is available on tap in Melbourne at a few places and Frank’s place is also serving it in this way. You’ve got to love the handle. The Moylander is a classic dialled up US IPA. It is extremely chewy and almost dries the mouth. It is outstandingly bitter. I enjoyed the 640ml by myself over about half an hour. Next time I’ll share, but it was a great way to pass the time and hear the bar banter. Best exchange. “Two Coronas, mate”. “We don’t do Corona here”. “What?!?”. “Nah, mate – plenty to choose from, but no Corona”. “How can’t you have Corona?”. “We just don’t. Bud, but no Corona”.